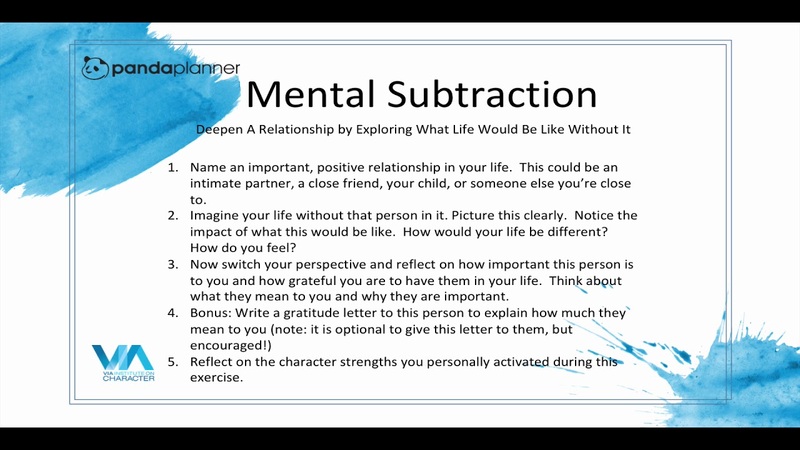 Deepen a relationship by exploring what life would be like without it! What would your life be like without one of your best relationships? Hard to imagine, perhaps even painful or unbelievable. Give it a try and then supercharge the activity with an extra dose of appreciation. Name an important, positive relationship in your life. This could be an intimate partner, a close friend, your child, or someone else you’re close to. Imagine your life without that person in it. Picture this clearly. Notice the impact of what this would be like. How would your life be different? How do you feel? Now switch your perspective and reflect on how important this person is to you and how grateful you are to have them in your life. Think about what they mean to you and why they are important. Reflect on the character strengths you personally activated during this exercise. If you’re interested in finding out more about Character Strength Interventions, check out our VIA advisor, Ryan Niemiec’s book on Amazon. All rights reserved. PANDA PLANNER and the panda logo are trademarks or registered trademarks of Panda Planner.